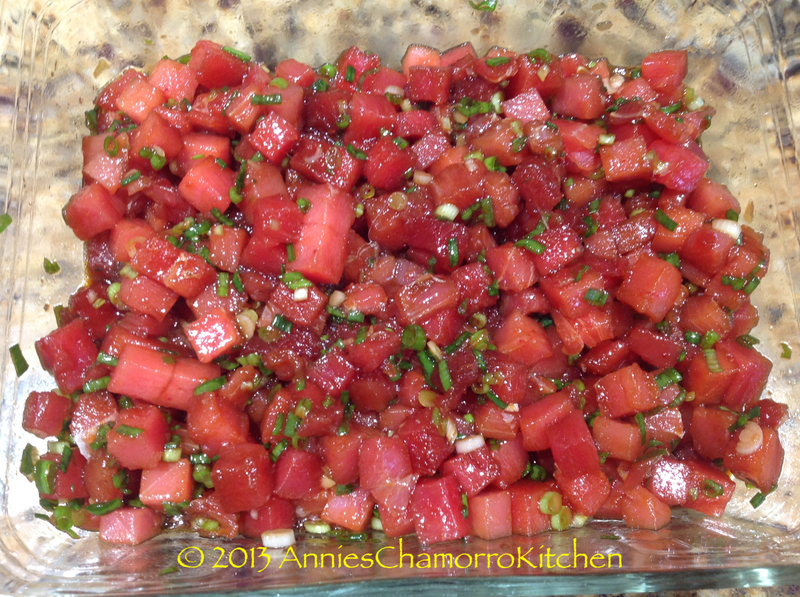 Poke is a Hawaiian dish traditionally served as an appetizer, but it can also be a main dish when served with rice or corn titiyas. 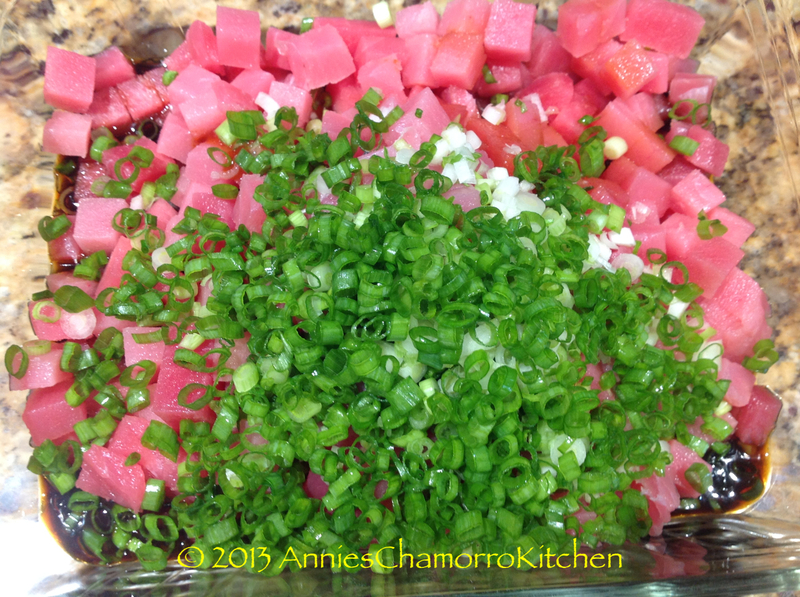 Modern versions of poke can vary depending on the ingredients you have on hand. 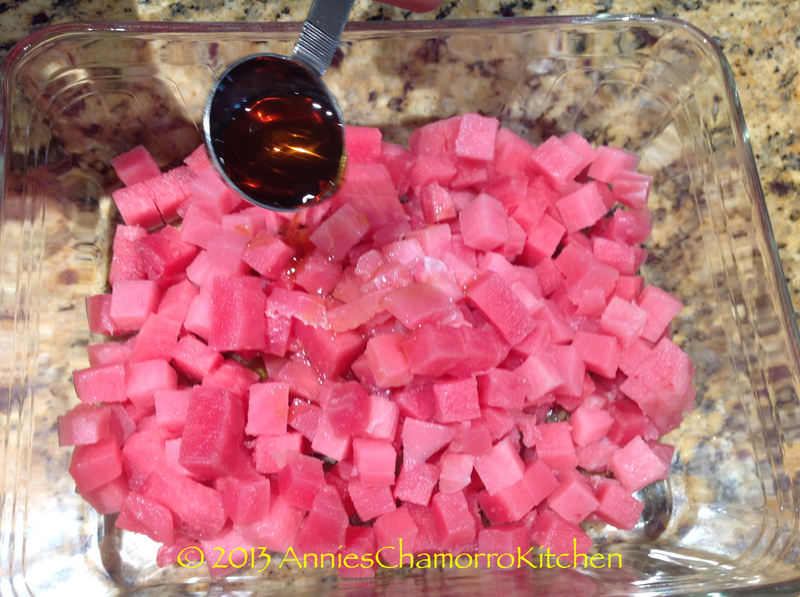 Poke is typically made with cubed ahi tuna marinated with soy sauce (some use sea salt), ground kukui nut (the meat in the inside, though, not the entire nut), sesame oil, ogo seaweed, and hot chili peppers. You can also use fresh salmon or octopus instead of ahi. 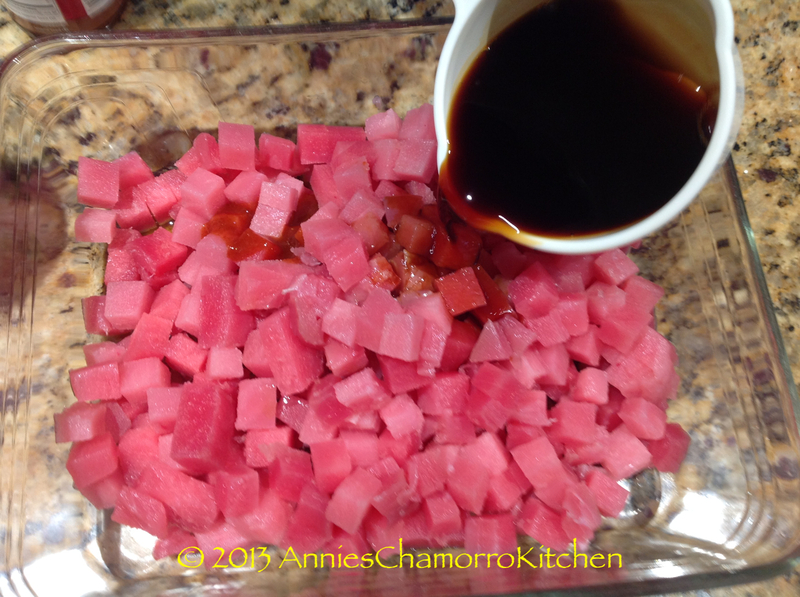 Living in Colorado, I don’t have access to a lot of the traditional ingredients like ogo seaweed and kukui nuts, so I created a different version of poke that my family — especially my 11 year old daughter — loves. It’s a simple recipe that you can take to entirely new levels by adding the other optional ingredients I listed below. 1. 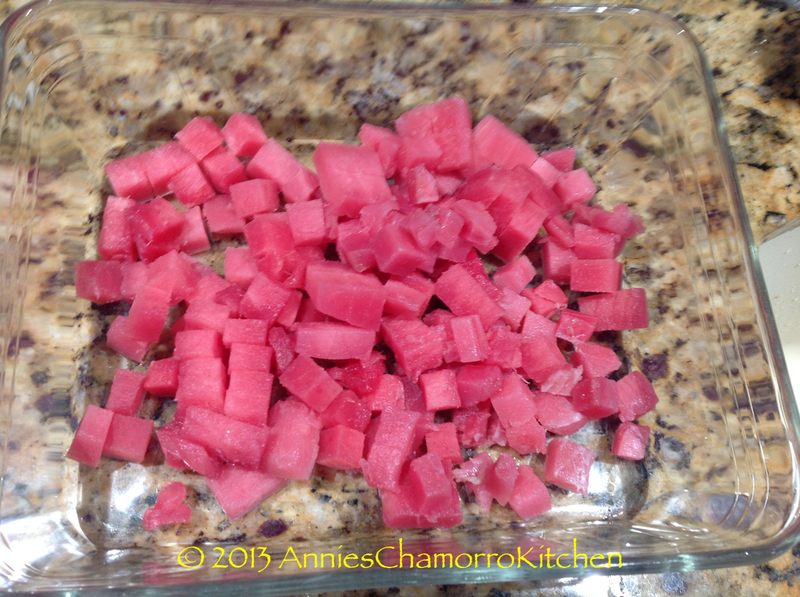 Cut the ahi into small cubes. 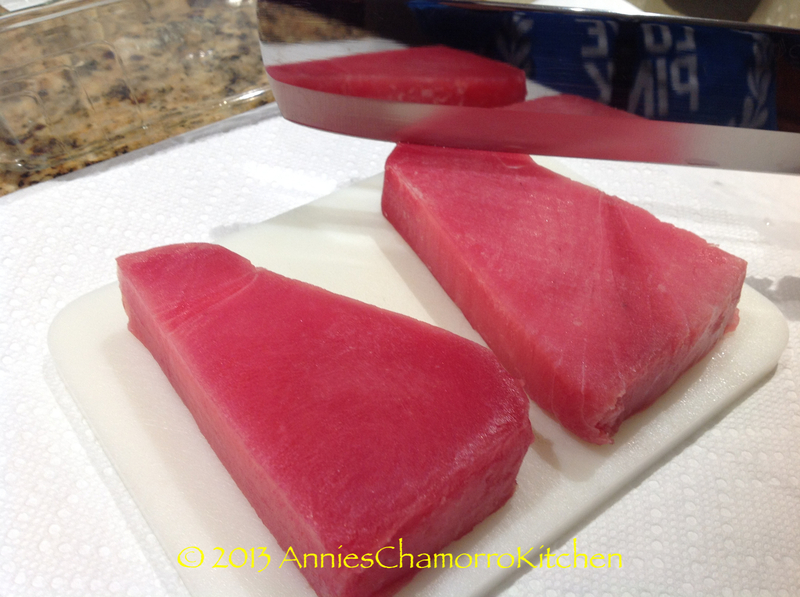 I find it’s easier to slice the ahi when it’s partially frozen. 2. Add the sesame oil. 3. Add the kimchee base (you can use a chili sauce like Sambal Oelek if you can’t find kimchee base). 4. Add the soy sauce. 5. Add the green onions. 6. Stir to combine. 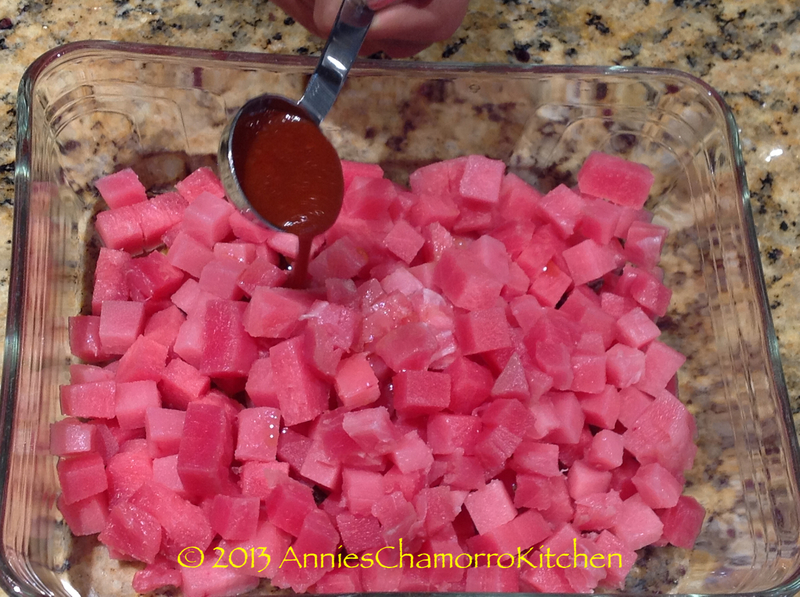 Let the poke sit for at least 30 minutes (refrigerated) to allow the flavors to meld. 7. Serve with hot white rice or freshly made corn titiyas (tortillas). The photo below shows the ahi tuna poke (on the bottom right of the plate) and ahi tuna sashimi (that’s another recipe, to be posted soon) on the bottom left. this is awesome! 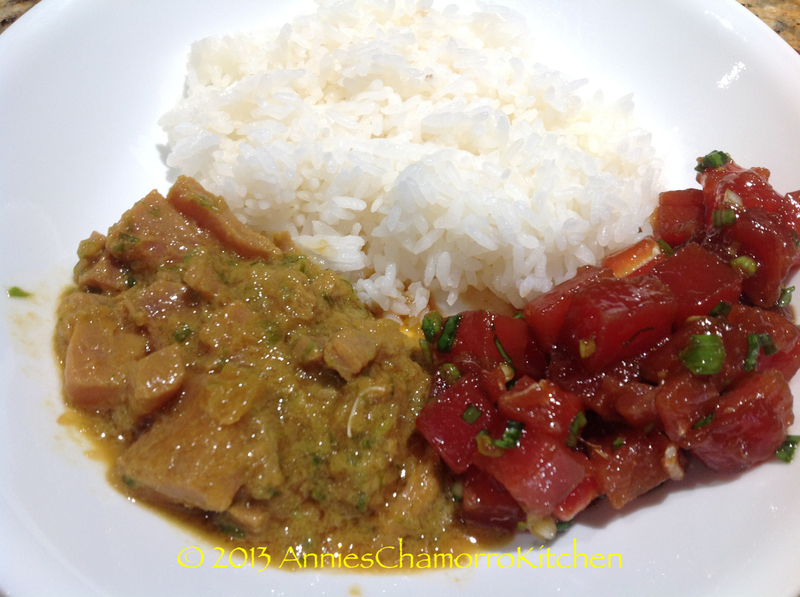 I am so glad I found your website, I have been trying to find the recipes, for all kinds of Chamorro food that I loved to eat when I was stationed on the Navy and have not been able to find… especially this Poke! the ingredients, that you have here listed as the substitutes since you cant get the traditional ingredients is exactly what I remember eating, except I remember there being Daigon in it too. Now, I ust hope you have a recipe pickled mango and papaya and my life would be officially complete! Made this tonight and I LOVEEEEEEEEEEEEEE it… added cucumbers and the furikake seasoning and whew its bomb.com Thank you! You’re welcome! Glad you liked it. It’s crumbled dried seaweed that’s seasoned. You can find it at most Asian stores. Furikake is so awesome sprinkled on top of hot rice. Hope you are able to find some. Amazon might have it. Good luck. Hafa Adai Annie!! I am so thankful I found your website!! I, too, am from Guam and miss it very much!! Recently I was able to visit 2x in the last year and was reminded just how blessed we are to be from such a beautiful island in the Pacific. Sad to admit that we took that beauty for granted; however, my children have had the chance to visit and fall in love with God’s beauty every time we go back. Hubby is in the Navy and we are hosting an event within the next couple of weeks and I was looking for another version for lumpia and stumbled upon the kimchee noodles and poke. SO EXCITED TO TRY!!! Thank you again for sharing our childhood dishes with us! DANGULU NA SI YU’US MA’ASE!!!!! Hafa Adai, Jenny! You are so fortunate to have had an opportunity to visit our beautiful island home! Take me with you next time, okay? Come back soon and let me know how your event went. I’d love to hear about it.